Contest begins on 11/1/2018, and will end on 11/9/2018 at 10:00 am CST. One (1) winner will be selected at random from entries to receive a prize of two (2) tickets to the Wrangler National Finals Rodeo, a two (2) night stay at the Hard Rock Hotel & Casino, a $1500 (one thousand five hundred dollars) travel voucher and a $500 (five hundred dollars) Cavender’s gift card. Prizes are non-transferable and no substitution will be made except as provided herein at the Sponsor’s sole discretion. Sponsor reserves the right to substitute a prize for one of equal or greater value if the designated prize should become unavailable for any reason. Winner is responsible for all taxes and fees associated with prize receipt and/or use. Odds of winning a prize depend on the number of eligible entries during the Giveaway Period. This contest is available only on CavendersRanch.com. Must be 21 years or older and a resident of the contiguous 48 states plus Alaska and Hawaii. Void where prohibited by law. Employees of Cavenders.com, Cavender’s Boot City, vendors of Cavender’s Boot City, their families and significant others are ineligible. Winner will be selected at random. Odds of winning depend on the total number of entries received by the due date. Winner will be notified via email or phone by a representative of Cavender’s. Winner must respond to notification by email or phone call in order to receive the prize. In the event that the winner does not respond within 48 hours of notification, a new winner will be selected at random. Valid photo identification may be required to receive prize. Prize will be mailed to the winner as soon as a response to the notification is received. Prizes may also be picked up in person at participating Cavender’s store. Prize are not assignable and nontransferable. No substitutions allowed by the winner. Prizes are not redeemable for cash. Winners are solely responsible for reporting and payment of any taxes on prizes. 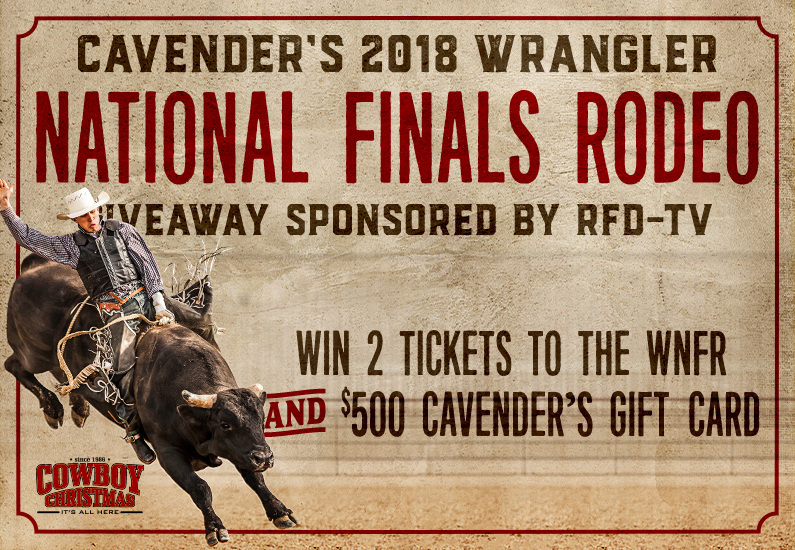 Prizes not won or claimed by eligible winners in accordance with these Official Rules will not be awarded and will remain the property of Cavender’s. The list of winners will be posted below after winner confirmation is complete. The decisions of Cavender’s regarding the selection of winners and all other aspects of the Contest, shall be final and binding in all respects. If you have questions regarding these rules, please contact Cavender’s Jennifer Green, jennifer@cavenders.com.